What’s the Average Cost of Utilities Where You Live? If you are trying to save money, take a look at your electrical usage. That’s the message from a new report detailing average utility costs across five different categories for every state across the country. Researchers at move.org crunched the numbers for five essential utilities. They looked to the U.S. Energy Information Administration (EIA) to determine average electrical consumption per U.S. resident. They also used EIA’s figures for average natural gas usage, which is 168 cubic feet per day. They relied on Numbeo to calculate average figures for both Internet and cable bills, assuming 60 Mbps with unlimited data. And finally, they looked to the U.S. Environmental Protection Agency (EPA) to estimate the average daily water usage of 300 gallons per day for a family. This methodology gives us a true apples-to-apples comparison of utility costs across states. 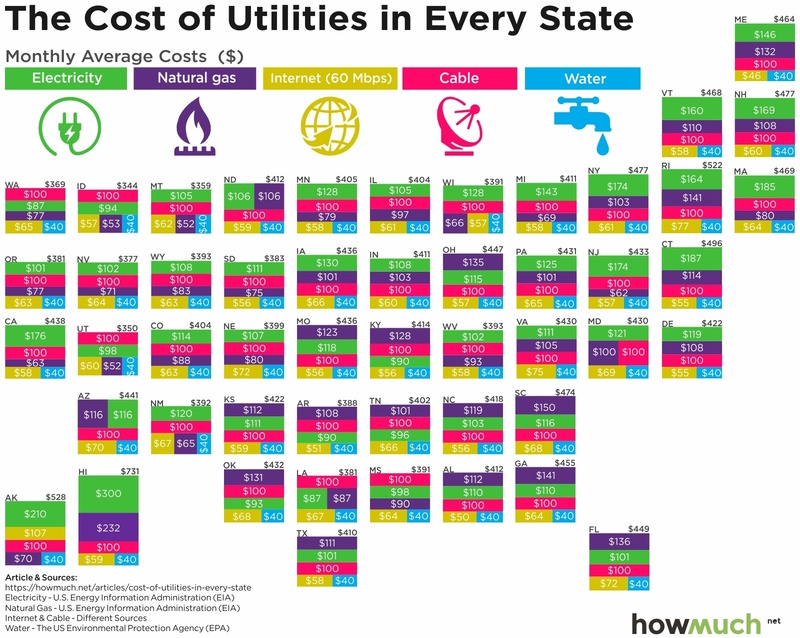 And instead of creating a simple heat map comparing total prices, we broke each state into a diagram illustrating how much each one costs, letting you easily see which states and which utilities drive the highest monthly expenditures. At its most basic level, our visualization demonstrates where utilities are very expensive (or relatively cheap). There’s an obvious large block of color in the Northeast representing a cluster of states with above-average prices. Hawaii and Alaska both stand out toward the bottom left of the map as well. The most budget-friendly states stretch across the Midwest and West. Idaho takes first place as the cheapest state overall at just $344 per month. California is also relatively expensive but not necessarily budget-shattering at $438. One way to think about these figures is to compare it with population density. Utilities cost more where there is higher demand, like the Northeast. Hawaii and Alaska stand alone as unique situations given their geographic distance from the mainland. And as we might expect, prices are substantially lower in sparsely populated regions, like the West. But the real value of our visualization is how it ranks each category. Electricity is the most expensive for every state in the Northeast, but natural gas takes first place across the South. And here’s the interesting thing. There appears to be a ceiling on the cost of natural gas, but not electricity. In some states like California, New Jersey and Massachusetts, electricity makes up a whopping 40% of the overall outlay for utilities. Compare that to states like South Carolina and Georgia, where natural gas sits at about 32% of the total. To put it simply, electrical rates are the primary driver pushing up overall utility costs. If you want to save money, odds are you should look for high-efficiency light bulbs and appliances.